The South Australian Government is exploring social impact investment as part of a range of initiatives to promote innovation in the delivery of social and community services. 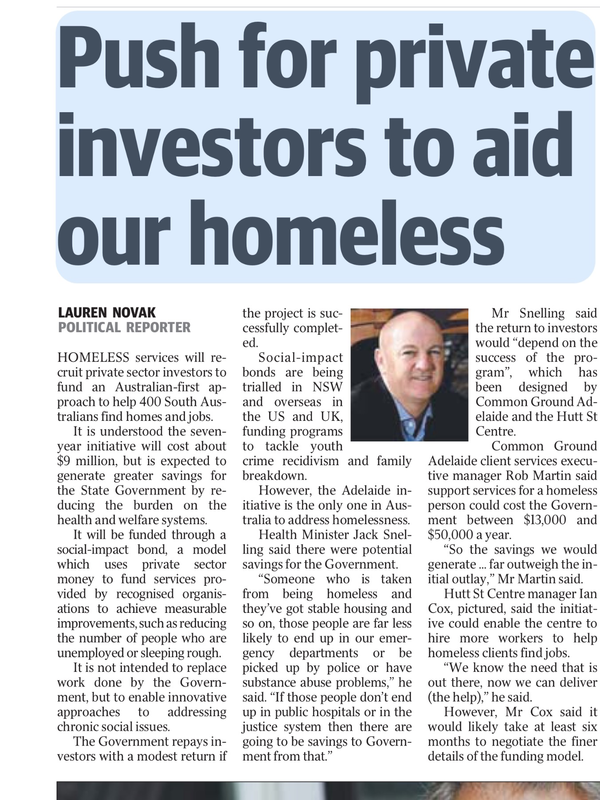 Following evaluation of an expression of interest, on 27 August 2015 the government announced that it will proceed to negotiate with local homelessness service providers, Hutt Street Centre and Common Ground Adelaide, to develop South Australia¹s first social impact bond. Social impact bonds (SIBs) and ‘pay by results’ contracts are about better outcomes for individuals and communities. Under these arrangements governments agree to share the financial benefits delivered through innovative social programs. Private investors may then provide the capital to pay for the program delivery, and then receive a rate of investment return that is linked to the success of the program, as measured against clearly defined outcome objectives. A preliminary discussion paper, 'Building a Stronger Society', was released in December 2013 and responses were sought from interested organisations including service providers, investors and financial intermediaries. More details about the potential focus areas is contained in the expression of interest documentation. The South Australian Government selected Social Ventures Australia (SVA) to deliver a series of training workshops as the next step to build capacity amongst service providers and government staff. These workshops were held over July and August 2014. South Australian based organisations that were unable to attend the workshops but would like to receive copies of the training material can do so by clicking here. Over the last few years SIBs have been trialled in a growing number of countries. No two SIBs are alike, reflecting the high level of experimentation and innovation that occurs when a new market develops. SVA has developed case studies summarising the key features of a range of SIBs from around the world. Deciding whether a Social Impact Bond is a viable funding model for a particular social program is a complex process that involves the consideration of a large number of factors. To help organisations think about these issues the South Australian Government and SVA have developed a self-assessment tool that may assist in identifying the potential strengths and challenges in developing a SIB for a particular program. See a list of useful links and resources on social impact bonds. Link to the Social Impact Investment Network, South Australia. Link to the Partnership Portal for community sector organisations in South Australia (developed by the Department for Communities and Social Inclusion).